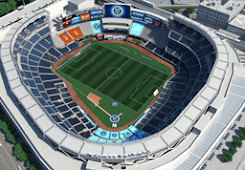 NYC is Blue: Fusion: "Stadium Search Reveals a Pattern of Clumsiness and Community Indifference"
Fusion: "Stadium Search Reveals a Pattern of Clumsiness and Community Indifference"
Fusion's Elliott Turner has an interesting take on the ongoing stadium drama. Major League Soccer coveting a soccer-specific stadium in New York City predates NYCFC’s inaugural 2015 season. Yet despite four years of intense lobbying and proposals, it’s still a pipe dream. Fans rightly wonder who is to blame. The easy answer, as always, is New York City politics. The harder answer, however, requires a tougher look at the strategies utilized to get a stadium deal done. Or, rather, not done. I sent information requests to key city officials and reviewed public records to get the best glimpse possible of that strategy. The picture is not exactly pretty. For years, MLS talked about a team in New York City proper. However, things got serious in April of 2012, when the league met with the Hudson River Park Trustees to discuss a potential soccer-specific stadium at Manhattan’s Pier 40. Talks progressed and, two months later, the Hudson River Park Trust and Park Advisory Council sanctioned a public meeting to discuss the proposal. Cesar Diaz attended and reported on the meeting for US Soccer Players. From the onset, he notes, Pier 40 had several problems. The Hudson River Park Trust, the legal entity responsible for maintaining the park and pier, needed over a $100 million in repairs and had only $25 million in reserves (and an anemic annual income). Given that backdrop, nobody was surprised the meeting went poorly. Further complicating matters, MLS’s proposal was not legal as per the terms of the Trust. Lastly, lots of folks voiced concerns about the MLS stadium, but few actually spoke up in favor of the idea. 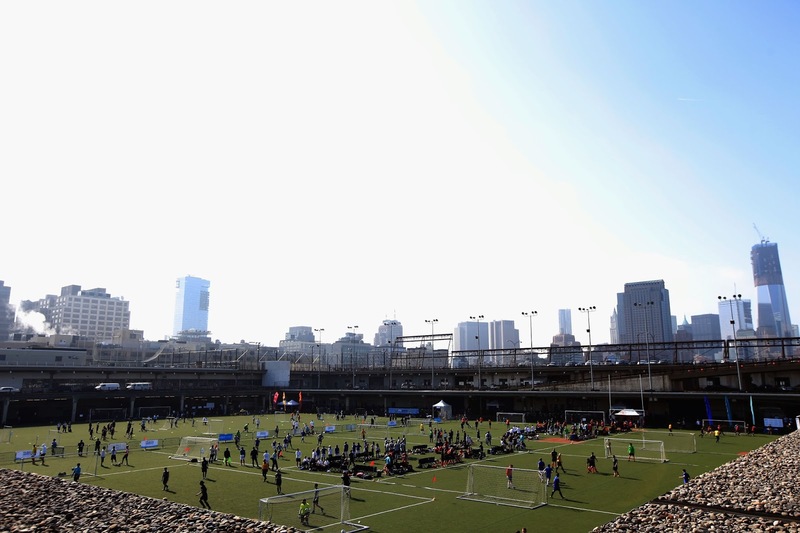 Despite all this, Hudson River Park graciously agreed to host an MLS All-Star event in July 2012. Yet that same month, MLS ditched the Pier 40 idea. It had a new plan: build a soccer stadium on top of already existing soccer fields in Queens. Ten months later, MLS announced that the league would be adding NYCFC, a team backed by wealthy owners from the Middle East and the New York Yankees’ ownership group. Two months later, the Queens plan got dumped. Again, legal issues tainted the proposal. Turns out, to build a stadium on a public park, one needs the state legislature’s approval. 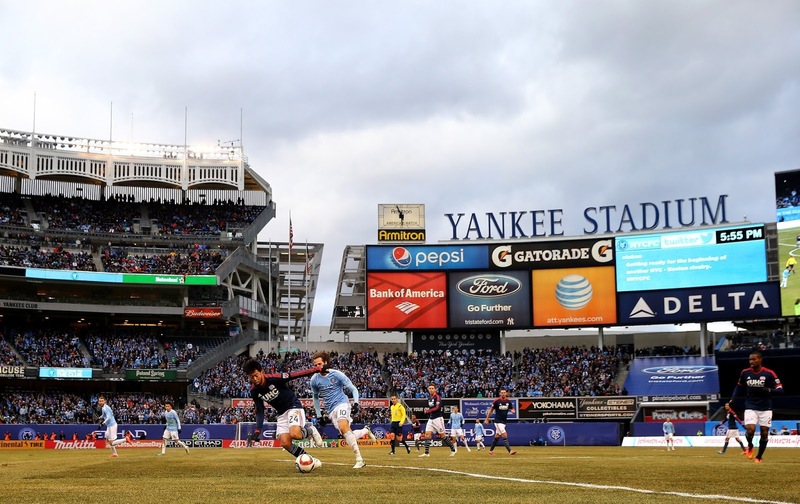 NYCFC quickly pivoted and set its sights on a Bronx location. Politically, then New York City Mayor Michael Bloomberg was warm to the proposal (and the $100 million in tax breaks), even if the president of the New York City Council was anti-sports stadium subsidies. In January 2014, a Bronx town hall meeting was announced. Neil deMause, proprietor of Field of Schemes, a blog that closely scrutinizes stadium finance deals all over the U.S., attended the meeting. deMause noted that NYCFC pulled out all the stops, including getting its partner, the New York Yankees, to bring union construction workers and youth sports players to appear and speak in support of the proposal. But the plan backfired when a resident noted that the amorphous “community benefits agreement” that was part of the new Yankees stadium deal had resulted in diddly squat for locals. Things weren’t looking good for NYCFC. No Manhattan. No Queens. No Bronx. Did NYCFC turn its attention to a location in Staten Island or Brooklyn? Was it going to borough-hop yet again? Nope. Instead, the Times broke a story on April 29, 2015, that NYCFC was considering a stadium on land owned by Columbia University that was being used as an athletic complex. This is where things get really weird. I sent public information requests to the Mayor’s Office, the Manhattan Borough President, and Councilman Ydanis Rodriguez, who represents the Manhattan district containing Columbia University and the proposed stadium. I asked for all emails and written documents related to the NYCFC proposed stadium in an effort to learn more about the proposed Columbia location. Based on past stadium stories I’ve covered, a paper trail always exists, especially if a stadium deal is close to fruition or at least being taken seriously. The Mayor’s Office repeatedly delayed responding to the information requests and, to date, hasn’t turned over any documents. Since I filed the requests in July, they have insisted on extensions just to give an initial response—three times. The Columbia location’s value to NYCFC was fairly obvious: the site already had a stadium and a property tax exemption. However, as deMause noted, the cost of tearing down a 17,000-seat Columbia stadium and building a new one would raise the price tag to $100 million more than any other MLS stadium. In addition to the cost issues, records showed that Councilman Rodriguez’s office received a wave of complaints from residents immediately after the Times story broke. Locals were not warm to the idea. In fact, they hated it. Rodriguez’s email was flooded with residents complaining about the potential traffic. More serious, though, was a letter sent from Park Terrace Gardens’ legal counsel, dated June 1, 2015. In that letter, counsel noted that Columbia’s Wien Stadium was approved under New York City zoning law as residential “R7-2.” That would have to change for the stadium project to move forward. Again, that thorny issue of “legality” either had not entered the equation when considering the stadium site or, perhaps naively, was considered an issue that could be handled at a later date. Rodriguez’s office also turned over emails from members of the Manhattan Community Board. Most were angry. One member demanded that any stadium only hire locally. Another doubted that MLS could compensate for any “interruptions and inconveniences.” Also, notably, nobody from NYCFC bothered to contact Councilman Rodriguez or the Community board about the stadium either before or immediately after the story broke. Unfortunately, sending open records requests to MLS or NYCFC or Columbia University is a non-starter because they are private entities, and private entities are under no obligation to respond to such requests. MLS has always politely declined to comment on past stadium stories. However, an NYCFC official agreed to speak with me on condition of anonymity. According to the official, there really wasn’t much breaking news on the stadium front. The club is committed to staying in New York City and looking at various sites. All the necessary transportation and public transit ducks have to line up just right. The club, the official added, is in talks with local politicians, including the Mayor’s office and possible partners, but has been pretty happy with the first year at Yankee stadium. Basically, NYCFC is viewing things long-term and wants to be sure it gets the right site for a dope stadium. Fair enough. But the stadium search has also revealed a troubling pattern. First, NYCFC picks a site regardless of those pesky things called “laws.” Building on green space or in a residential area will require New York state or City Council approval, which is tough when you assume NYCFC will probably also be asking for some sales or property tax breaks. Only the Yankees parking garage idea, as proposed, could have been done legally. Second, NYCFC (and MLS) selects a site with serious financial questions. Hudson Park and the Yankees parking garage were seriously distressed properties. Columbia University is obviously doing fine, but demolition costs would have been astronomical. Third and most frustratingly, NYCFC (and MLS) has either been slow to engage the local community or left the game with cards on the table when things got tough. They participated in community town halls for the Pier 40 and Yankees parking garage pitches, but then refused to sweeten the pot with more community benefits after residents and local politicos raised concerns. If NYCFC had countered back to the newly-elected Mayor de Blasio by asking for less Yankees parking garage debt forgiveness or handing over more community benefits, would a stadium have happened? Maybe. Maybe not. But we’ll never know because that second offer, at least publicly, never was on the table. Like all new clubs, NYCFC faces an inertia dilemma. It lacks the history and fan base to put much weight behind the push for a public place to build a home in New York City. Also, given the club name, NYCFC needs a stadium in New York proper. It probably can’t threaten a move to elsewhere, like former Yankees owner George Steinbrenner, to coax a sweet deal. From the outside, it looks like the club is hopping between boroughs to try and get the best deal. However, the Manhattan community board emails show that it’s a questionable strategy, considering members insist on tangible community benefits and urge one another to stay strong like other boroughs. Orlando City SC's new stadium is slated to be up and running and bleeding purple in 2016. New York City soccer fans must look at a club like Orlando City SC with jealousy. 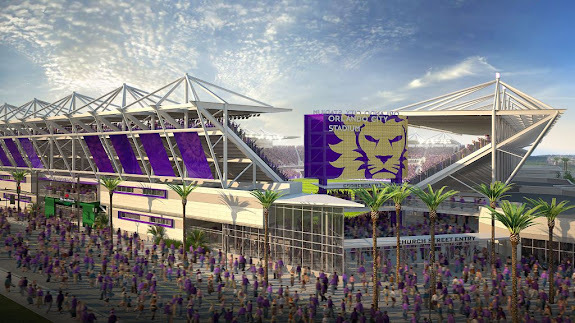 In July of this year, Orlando City and the City of Orlando joined forces and will build a lovely downtown stadium. The cost will be around $155 million and the project is expected to take 14 months to complete. Keep in mind that Orlando City has only played in Orlando for five years (after relocating from Austin) and been in MLS for one. If the City of Orlando can get things done, then why not New York? New York’s annual budget is $66 billion dollars. How can a few hundred million in tax subsidies for a stadium hold things up? The answer is simple: because it can. New York City knows its value and worth, and drives a hard bargain with all businesses. Space is also at a premium. Folks enjoying the new Yankees stadium forget about the two decades of threats and negotiations with the Mayor’s office. Twice, the Yankees almost moved to New Jersey but were eventually talked down by the legislature and a defeated referendum to curb proposed subsidies. 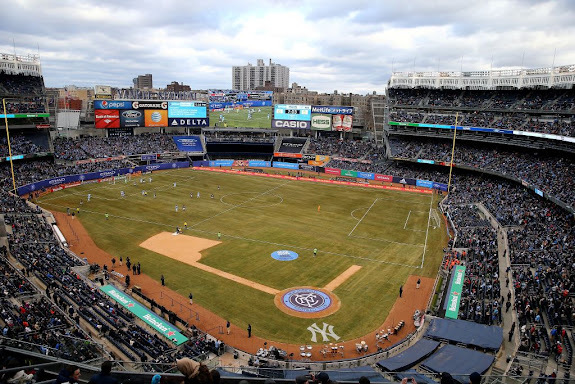 If the wealthy and legendary Yankees needed twenty years to clinch a deal, NYCFC should not expect the perfect site to fall in its lap on any sort of expedited timetable. Still, that’s no excuse for a flawed strategy. NYCFC needs to get serious about engaging the community. Right now, NYCFC makes a proposal, politicians raise concerns, and they walk. The time has come for NYCFC to stop searching for distressed properties, properly assess the legality of any proposal beforehand, and offer a nice community benefits deal similar to those offered by the Brooklyn Nets and Yankees. If NYCFC’s wealthy owners—who also own Manchester City—could afford to pay Yaya Toure a couple hundred thousand pounds per week, surely they can sweeten the pot. For now, fans need to get used to the sight lines at Yankee Stadium. Remember, DC United won plenty of MLS Cups while languishing in a decrepit RFK stadium that was never intended to house soccer. The Washington political machine is just now grinding out a deal to move United into new, shiny digs. A successful team does not assure a stadium. Not even designated player power can do that. Until NYCFC tightens its act, the failed proposal list will keep growing. Pier 40. Flushing Meadows Park. The Aqueduct Racetrack. Wien Stadium. We may soon lose count. And fans will likely start to lose patience sooner rather than later. That's as good a summary of the situation so far as I've read, with a few caveats. We've seen that there was a rough plan for a soccer-specific stadium on Pier 40, although I don't know how formed that plan was when the initial meetings were held. He's stretching a but with his list of failures. I'm not inclined to hold NYCFC responsible for the failure to strike a deal for either Pier 40 or Flushing Meadows, as those predate the expansion announcement. Similarly, the Aqueduct plan doesn't ever appear to have been serious. That's not to say that the club has done its job. They obviously haven't, and need to be held responsible for the collapse of the Bronx deal. I've heard two explanations for the parking garage owners' refusal to sell; they either felt too set in their ways to move the business, or they googled "Sheikh Mansour" and kept holding out for increasingly outrageous sums of money. Regardless, it was a nearly-perfect solution and should have happened. For what it's worth, I've long suspected that the stadium shambles was behind Tim Pernetti's ouster. Here's hoping that Tom Glick can succeed where he failed.